Tai Chi has finally caught on in the field of geriatric care and research – and this is great news for the estimated 2 million people over the age of 65 who suffer from depression. Tai chi chin is a westernized version of the Tai chi chuan, which is an internal Chinese martial art that has been practiced for centuries. Tai chi chin is a series of 19 moves with one pose that focuses on developing and balancing internal energy – chi. It is believed that this practice increases overall well-being, physical energy and stamina. Recently Tai chi chin has received tentative acceptance as being beneficial for overall psychological health. A review published in the BMC Complementary and Alternative Medicine found that Tai Chi is effective at reducing stress, anxiety, depression and increasing self-esteem. But the impact on seniors was particularly noteworthy … and important during a time when we face a crisis of affordable humane and empowering nursing home care. Two studies published in 2009 found that Tai chi chin reduced osteoarthritis pain. Tai chi chin incorporates a range of motions that increases muscle conditioning and flexibility. Increasing physical strength and flexibility helped to improve overall movement and reduced pain in 20 of the participants of this study. The practice that builds strength also aids in improving balance. The Oregon Department of Human Services incorporated Tai chi chin programs in an effort to promote physical activity as a way to prevent injuring and sometimes life threatening falls in older adults. All of the adult community centers that provided Tai chi chin to their residents saw a significant reduction in falls and an increase in physical independence. Another study published in 2007 showed that practicing Tai chi chin boosted the immune systems of older adults. Even with new vaccinations against the flu and the very painful shingles, many elders still succumb to the viruses. This study included 112 adults ranging in age from 59 to 86. Over a 25 week period one group practiced Tai chi chin and the other received training in stress reduction, nutrition and improving sleep habits. Both groups received the vaccination for shingles. At the end of the study, the group that practiced Tai chi chin had immunity to shingles that was twice that of the control group. An ounce prevention can save lives. 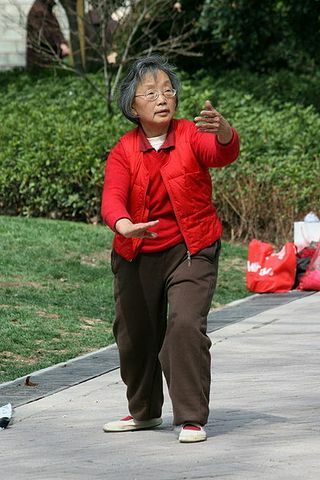 The most recent study showed that practicing Tai chi chin helps our elders keep depression at bay. This study conducted at UCLA and published in the American Journal of Geriatric Psychiatry found that in combination with traditional antidepressant, tai chi chin helped those elders who suffered from major depressive disorders. The study included 112 adults who were 60 or older, diagnosed with major depression, and were treated with an antidepressant but not Tai Chi. Of those 73 showed only minimal results. This seems to support that the current research reviews that many antidepressants may not be as effective for some individuals. Those who were in the Tai chi chin classes improved. 65% of them went into “remission” – as opposed to 51% of those in the control group. Practices that bring together the mind, body and spirit are finally gaining ground in clinical settings. Tai chi chin has over 2,000 years of history behind it. That’s 2,000 years of giving elders the balance, peace and empowerment they need for a long life. Hopefully in time, we will begin to bring this practice along with many others into the lives of our grandmothers and fathers here in the West so that they too can enjoy a long life.